When: April 26th, 2019, 1:00 p.m. to 4:00 p.m.
Members of the Colombian “Committee for the Defence of Water and the Páramo” will speak about their ongoing struggle to protect the highland wetland “Páramo de Santurbán”, which provides water for over 2 million Colombians, from Canadian and other mining companies. 2:30 p.m. Nearly Five Years after the Mount Polley Mine Waste Disaster: Now What? Bev Sellars, author & activist on Indigenous rights issues, acting chief of the Xat’sull First Nation when the Mount Polley tailings dam collapsed in 2014, will be sharing some thoughts & lessons to learn from the largest mine wate disaster in Canada's history. The small municipality of Grenville-sur-la-Rouge is being sued by Canada Carbon for attempting to protect its citizens and its environment from open pit mining, and will be before the Quebec Appeal Court on May 17 to argue this suit is abusive & amounts to a SLAPP suit (Strategic Litigation Against Public Participation). Council members & citizen representatives will be presenting on the case. Afterwards – Join us for a social get-together from 5 to 7:00 p.m.! 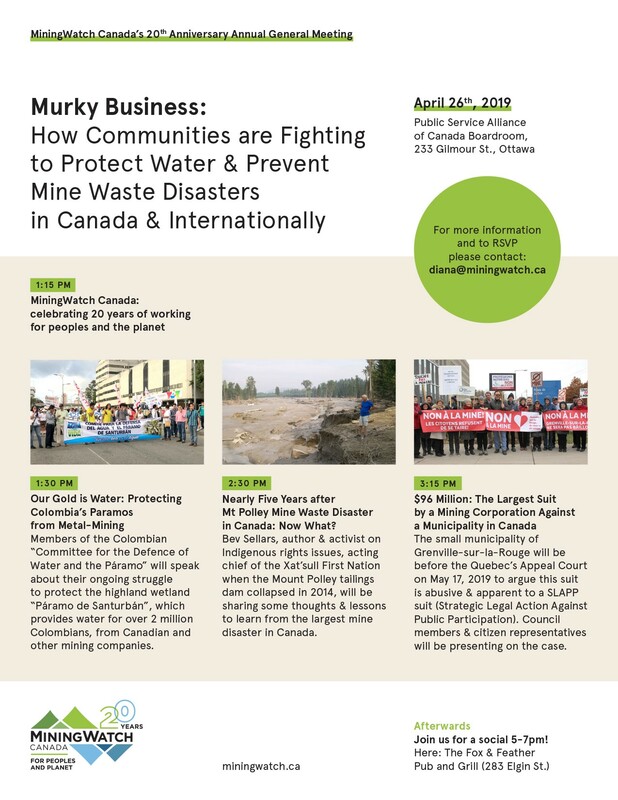 At the Fox & Feather Pub and Grill, 283 Elgin St.
For more information and to RSVP please contact Diana Martin, diana@miningwatch.ca, (613) 569-3439.